According to the broadened necessities of our supporters, we are displaying a wide extent of Automatic TTR Slitter machines. These items are made-up utilizing remarkable quality segments and current innovation via prepared faculty. So as to ensure quality, these items are sternly analyzed on various confinements by our quality reviewers. Plus, usefulness and ideal execution are a percentage of the viewpoints that build the need of our offered assortment in the business sector. 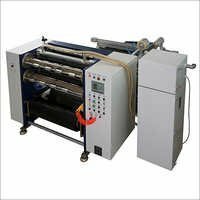 The machine is fabricated with high quality raw materials, which are procured from renowned vendors. We have a pool of expert professionals who keep in mind with international standards and give utmost attention to every detail of the product. The machine is completely automatic. The machine is fabricated with anti-corrosive material. The machine is precisely designed in line with international standard. The machine has hassle free functionality.